1. Plutonic (intrusive, abysal) – magmatic rocks with phaneritic structure, relatively coarse-grained (>3 mm), where minerals are discernible by naked eye. Plutonic rocks slowly crystallized and cooled at depth. 2. Volcanic (extrusive, effusive) – magmatic rocks with aphanitic structure, relatively fine-grained (<1 mm), where individual grains cannot be discerned by naked eye. Volcanic rocks originate by rapid cooling on Earth’s surface, or close to it. 3. Pyroclastic (volcanoclastic, fragmentary) – magmatic rocks with pyroclastic structure originating during volcanic activity. They contain fragments (pyroclasts) of rocks, glass or crystals, originating by fragmentation related either to magmatism or to transport to place of their deposition. They have not been altered during deposition. 4. Volcanic glasses – magmatic rocks with > 80 vol. % of volcanic glass. Polymodal classification is a specifc type of classification of pyroclastic rocks (Fig. 5) based on the size of pyroclasts. Pyroclasts are disintegrated fragments of various materials originating during volcanism. Compact rocks containing more than 75 vol. % pyroclasts are pyroclastic rocks. Non-coherent rocks containing >75 vol. % pyroclasts are tephra. If the disintegrated material is altered or redeposited, it is called reworked pyroclastic or epiclastic rock. All rocks originating by volcanic and superimposed processes are called volcanoclastics. Here also lahars are involved, originating by mixing volcanic materials, predominantly ash, with rain-, ground-, lake-, and meltwater. Pyroclasts less than 2 mm in size form a volcanic ash. Diameters of lapilli are between 2 and 64 mm, and fragments larger than 64 mm form blocks or bombs. Blocks are formed in a solid state and their shapes are angular. In contrast, bombs originated in partly or fully molten state and have thus rounded shapes. Tuffs are further subdivided into lithic tuff (predominance of lithic fragments), vitritic tuff (predominance of glass fragments), and crystal tuff (predominance of crystal fragments). Ignimbrite is the term commonly used by volcanologists to designate compacted tuff consisting of welded crystal and rock fragments cemented by matrix composed of glass fragments. Chemically, the ignimbrite usually corresponds to acid- to intermediate rocks. The term ignimbrite is sometimes used for a complete vertical profile with coherent pyroclastic rocks at base followed by pyroclastic flow in intermediate and pyrcolastic surge deposits in upper part. The term tuffite designates rocks containg both pyroclastic and epiclastic material. Pyroclastic rocks originating along contact of the volcanic material with water during submarine or subglacial eruptions are hyaloclastites or hyalotuffs. Fig. 5. 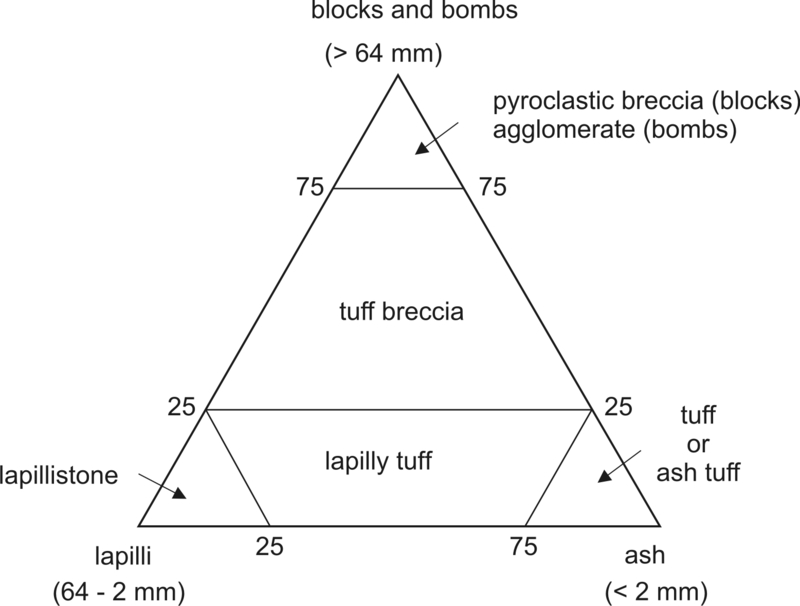 Polymodal classification of pyroclastic (volcanoclastic) rocks based on proportional abundance of pyroclasts of different sizes (after Fisher 1966). Modal composition represents volumetric ratios of minerals in rock expressed in volume %. Volcanic rocks contain light, felsic minerals (plagioclase, quartz, alkalic feldspar, muscovite, foids) and dark, mafic minerals (dark mica, amphibole, pyroxene, olivine). Content of mafic minerals is expressed by the parameter M. Felsic and mafic are not only minerals, but rocks as well. A felsic rock is composed predominantly of felsic minerals (granite, rhyolite), and mafic minerals prevail in the mafic rocks (gabbro, basalt). Rocks with more than 90 vol. % of mafic minerals are ultramafic. Colour of a rock is expressed by adjectives leucocratic and melanocratic. Leucocratic rocks are light-coloured, because they are composed of felsic minerals. Similarly, melanocratic rocks are dark-coloured and are composed of mafic minerals. Colour can be quatified using a colour index M´, which reflects the volume proportion of mafic minerals. The M´ index is expressed as volume percentage of mafic minerals, excluding apatite, muscovite, primary carbonates and similar minerals which are regarded as colourless. The relationship of the colour index with the terms melanocratic, leucocratic and others is obvious from Table 5. Petrologists use variable intervals of colour index, which are not precisely defined. In general, leucocratic rocks are brighter (lecocratic granite is brighter than ordinary granite) and melanocratic rocks are darker (melanocratic syenite is darker than ordinary syenite). Table 5. Names of rocks for different intervals of the colour index M´. A – alkalic feldspars – orthoclase, microcline, perthite, anorthoclase, sanidine, albitic plagioclase (An0-5). F – foids – nepheline, leucite, kalsilite, analcime, sodalite, nosean, haüyne, cancrinite, pseudoleucite. M – micas, pyroxene, olivine, opaque minerals, accessory minerals (e.g. zircon, apatite, titanite), epidote, allanite, garnet, mellilite, monticellite and primary carbonates. If a rock contains less than 90 vol. % of mafic minerals, it is classified according to contents of felsic minerals using Q+A+P or A+P+F diagram such that the M parameter is ignored, and other parameters are normalized to 100 %. Normalized values are then projected within upper or lower portion of the QAPF diagram for plutonic or volcanic rocks, familiary called „double Streckeisen triangular plot“ or „diamond diagram“ (Fig. 6). In the QAPF diagram, the plagioclase ratio corresponds to sub-vertical lines expressing the constant ratio of alkalic feldspars to plagioclases. For the rock above, the P parameter equals to 54.5 and the rock projects within the quartz monzonite field. Similar approach is used for silica-undersaturated rocks containing foids (F), which project into bottom part of the QAPF diagram. Fig. 6. Left: Modal QAPF classification of plutonic rocks (Streckeisen 1976). Right: Modal QAPF classification of volcanic rocks (Streckeisen 1978). 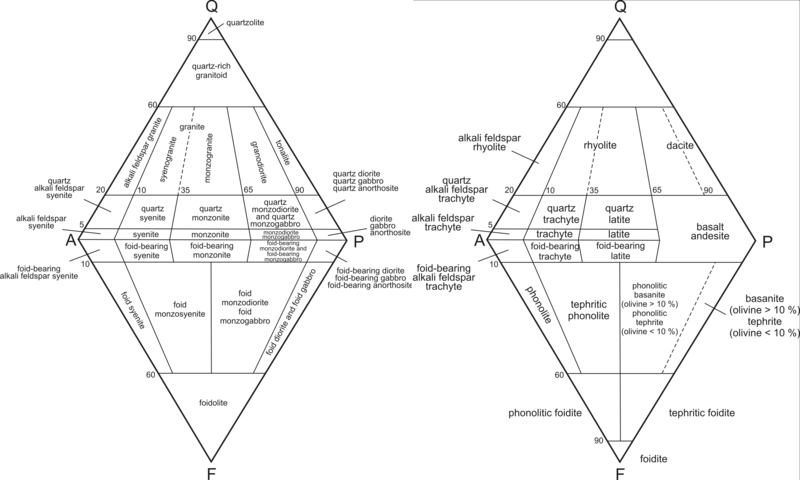 Apices of the „double“ triangle are represented by Q = quartz, P = alkalic feldspar, P = plagioclase, F = foids. The classification cannot be used for rocks with M > 90. The 10, 35, 65 and 90 coordinates correspond to plagioclase ratio P. Numbers on left sides of the diagrams correspond to modal percentages of Q (5, 20, 60, 90) and F (10, 60). Gabro, diorite and anorthosite project near the P apex in the QAPF diagram for plutonic rocks. Anorthosite contains less than 10 % of mafic minerals, gabbro contains >10 % of mafic minerals accompanied by basic plagioclases (An50-100). Gabbroid rocks sensu lato are classified in detail according to contents of orthopyroxene, clinopyroxene and hornblende (Fig. 7). The same principle is employed for the distinguishing between all types of plutonic rocks, which project into the same field of the QAPF diagram (e.g. monzodiorite – monzogabbro, foidic gabbro, gabbro and others). Similarly, andesite and basalt project together close to P apex in the QAPF diagram for plutonic rocks, and they can be preliminary distinguished according to the colour index and the SiO2 content. Basalt contains more mafic minerals (> 35 vol. %) and less SiO2 (< 52 wt. %, Table 6). Table 6. Discrimination between basalt and andesite according to colour index (expressed either as wt. % or vol. %) and SiO2 content (Streckeisen 1978). Fig. 7. Modal classification of gabbroid rocks based on plagioclase (Plg), pyroxene (Px), olivine (Ol), orthopyroxene (Opx), clinopyroxene (Cpx) and hornblende (Hbl) contents (Streckeisen 1976). Rocks projected within shaded fields are further classified using the bottom diagram. Phaneritic rocks with > 90 % of mafic minerals are classified according to modal content of mafic minerals (Fig. 8). These rocks are ultramafic and are composed almost entirely of olivine, orthopyroxene, clinopyroxene, hornblende, sometimes biotite, accompanied by a small amount of garnet, plagioclase and spinel. 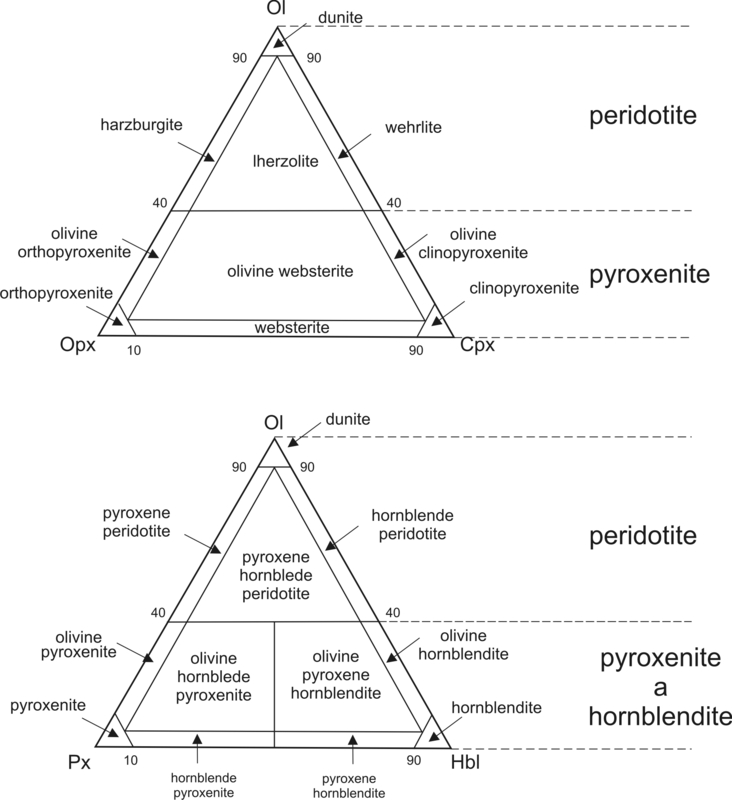 Peridotite differs from pyroxenite by a higher proportion of modal olivine (> 40 %). Dunite, harzburgite, lherzolite and wehrlite are major peridotite types. Pyroxenites are further subdivided in orthopyroxenite, websterite and clinopyroxenite. If an ultramafic rock contains less than 5 % of garnet, plagioclase or spinel, the prefix designates the most common mineral, e.g. garnet (spinel, plagioclase) peridotite. Fig. 8. Modal classification of ultramafic rocks based on olivine (Ol), orthopyroxene (Opx), clinopyroxene (Cpx) and hornblende (Hbl) abundances (Streckeisen 1973). There are several classification schemes based on bulk chemical composition, employing either the chemical composition expressed in wt. % or the normative composition expressed in mol. %. These classification schemes are used mainly for very finely grained rocks, for which determination of modal composition is impossible (aphanitic volcanic rocks). Alternatively, this type of classification can be used also for phaneritic rocks, in which the modal composition reflects the origin and evolution of parental magma. 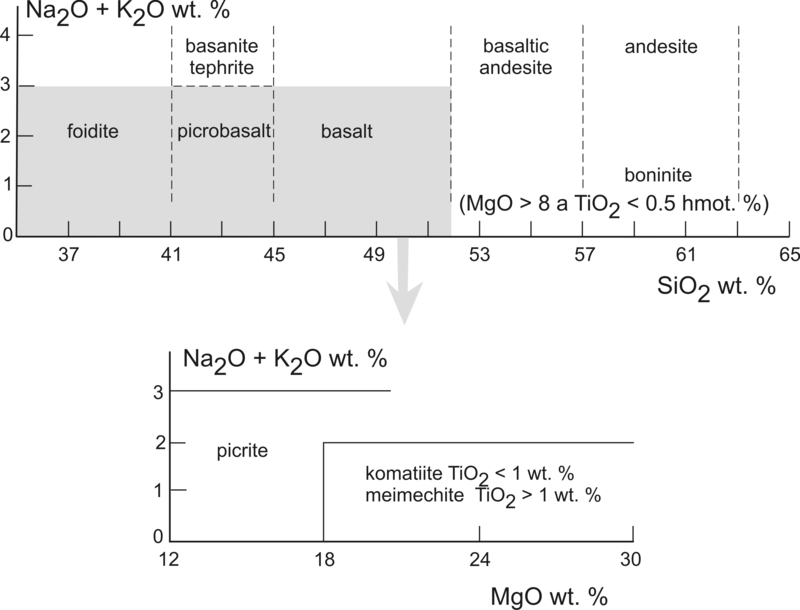 Apart from carbonatites, SiO2 is major oxide of all magmatic rocks, and its content serves as the basic parameter for most classification schemes. Ultrabasic (< 45 wt. % SiO2). Subdivision of magmatic rocks into the four categories has no correlation with modal abundance of quartz, though it is assumed that the acid rocks as a rule contain quartz, whereas the ultrabasic do not. Generally, though not strictly, acid rocks are rich in SiO2 (silicic), basic rocks correspond to mafic, and ultrabasic ones correspond to ultramafic. 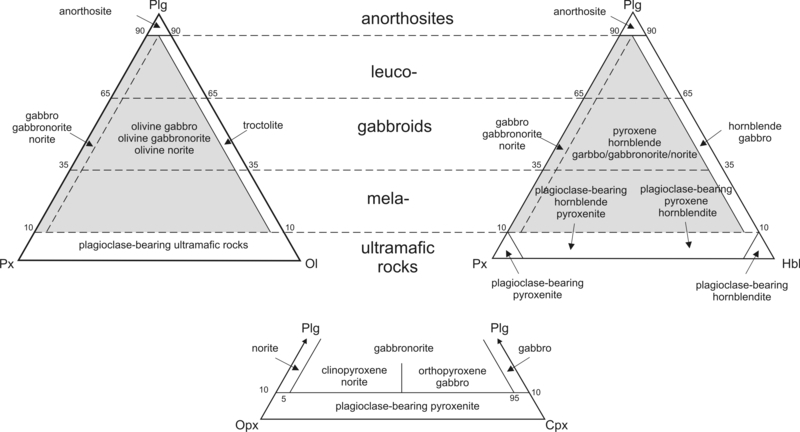 The TAS diagram is the mostly used classification of aphanitic volcanic rocks (Fig. 9). The acronym originated from initial letters of compounds projected along both axes (Total Alkalis vs. Silica). Hence, it is a classic cartezian variation diagram, in which horizontal axis is numerical expression of SiO2 content in wt. % correlated with the sum of Na2O+K2O on the vertical axis (LeBas et al. 1986). The TAS diagram is descriptive and it does not have any genetic meaning. It can be used also for the classification of glass-rich or glassy rocks with less than 2 wt. % H2O+ and 0.5 wt. % CO2. However, prior to classification, the chemical analysis must be recalculated to 100 wt. %, excluding H2O and CO2. Fig. 9. Chemical classification of volcanic rocks based on the total alkali content (Na2O+K2O in wt. %) and SiO2 (LeBas et al. 1986, 1992). Rocks in shaded fields are further classified according to bottom table. Other criteria must be employed to distinguish between rocks projected within the same field. For instance, basanite differs from tephrite by normative olivine, whose content is less than 10 mol. % in tephrite and above this value in basanite. Similarly, trachyte differs from trachydacite by content of normative quartz. Numbers within the diagram correspond to intersection coordinates of boundary lines. Trachybasalts are subdivided into hawaiite (Na2O-2>K2O) and potassic trachybasalt (Na2O-2 < K 2O). Similarly, basaltic trachyandesites with a higher Na2O content (Na2O-2>K2O) is mugearite and that with a lower Na2O content (Na2O-2 < K2O) is shoshonite. In the same way, trachyandesite can be subdivided to low-Na benmoreite and high-Na latite. Basanite and tephrite differ in terms of normative olivine content, which is higher than 10 % in basanite and lower than 10 % in tephrite. Similarly, trachyte and trachydacite differ in terms of normative quartz content. Foidite field includes all volcanic rocks with >60 vol. % of foids. These rocks are named according to the dominant foid, e.g, nephelinite, leucitite, etc. Melilitic rocks also project within the foidite field in the TAS diagram. Their discrimination from foidites employs individual and specific criteria based on normative and chemical composition discussed together with each rock type included in the electronic atlas. Some volcanic rocks with increased MgO concentration, such as picrite, komatiite, meimechite, boninite, project within several fields of the TAS diagram. Prior to being classified as foidite, picrobasalt or basalt, these rocks need to be first checked for their potential affiliation to a special type of volcanic rocks. This can be done by employing chemical classification (Fig. 10) based on SiO2, MgO, Na2O+K2O and TiO2 concentrations. Boninite contains >52 % SiO2, >8 % MgO and less than 0.5 % TiO2. Meimechite and komatiite have SiO2 content ranging within 30-52 wt. %, MgO >18 % and Na2O+K2O less than 2 %. Both rock types can be distinguished according to TiO2, which is below 1 % in komatiite and above this value in meimechite. Picrite also contains 30-52 wt. % SiO2, but MgO content is higher than 12 % and total alkalis are below 3 %. Kerr and Arndt (2001) proposed to abandon the strictly chemical classification of komatiite, which must in addition exhibit the typical spinifex structure in order to avoid situations, when some picrites devoid of this specific structure are classified as komatiites. Fig. 10. Chemical classification of “high-Mg” volcanic rocks – boninite, meimechite, komatiite and picrite (LeBas 2000). The rock projected within shaded field must be checked to affiliation with picrite, komatiite and meimechite according to MgO, Na2O+K2O and TiO2 contents. Similarly, high-Mg rock (>8 % MgO) with >52 % SiO2 is boninite if containing less than 0.5 wt. % TiO2. Apart from picrite, komatiite, meimechite, boninite and nephelinite, other volcanic rocks are classified directly by using the TAS diagram (Fig. 9). Basalt can be alkalic or sub-alkalic according to the SiO2 saturation degree. Alkalic basalt contains normative nepheline, whereas sub-alkalic does not contain foids. 3. alkaline basalt – ne in the norm. Fig. 11. 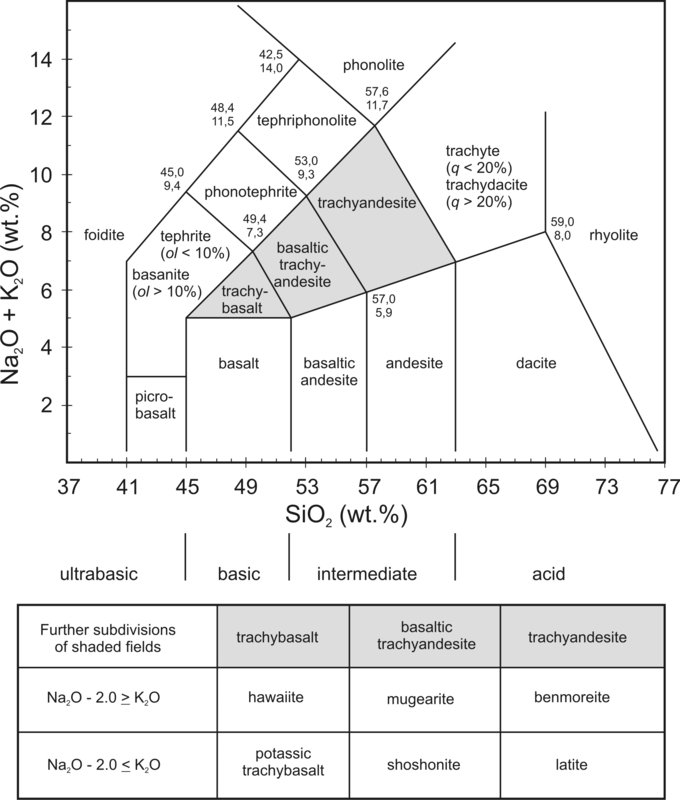 Classification of basaltic rocks according to SiO2 saturation degree. Left: basalt tetrahedron (Yoder and Tilley 1962) with basaltic rocks having various degrees of SiO2 saturation. Normative minerals are designated by italics. With absent normative values, true modal abundances (in parentheses) can be also used for classification. Shaded plane represents the boundary of SiO2 saturation, dividing Si-undersaturated basalts with normative olivine (ol), ± normative nepheline (ne) and modal foids from Si-oversaturated basalts containing normative quartz (q). Right: Depicted is basis of the tetrahedron viewed from diopside (di) apex. Apices of the triangle are accomodated to normative ol´ = ol + [0.714-0.067(Fe/(Fe+Mg))]hy, normative nepheline ne´ = ne + 0.542ab, and normative quartz q´ = q + 0.4ab + 0.25hy. Peralkalic rhyolite with the alkalinity index NK/A > 1 may also plot within the rhyolite field of the TAS diagram. Trachyte and trachydacite can also be peralkalic, and they are further subdivided according to Al2O3/FeO ratio to comenditic rhyolite – comendite, comenditic trachyte, pantelleritic rhyolite – pantellerite and pantelleritic trachyte (Fig. 12). Fig. 12. Classification of trachytes and rhyolites of comenditic and pantelleritic types based on Al2O3 and FeO contents (MacDonald 1974). Line coordinates: 0.45-5, 10.98-19. 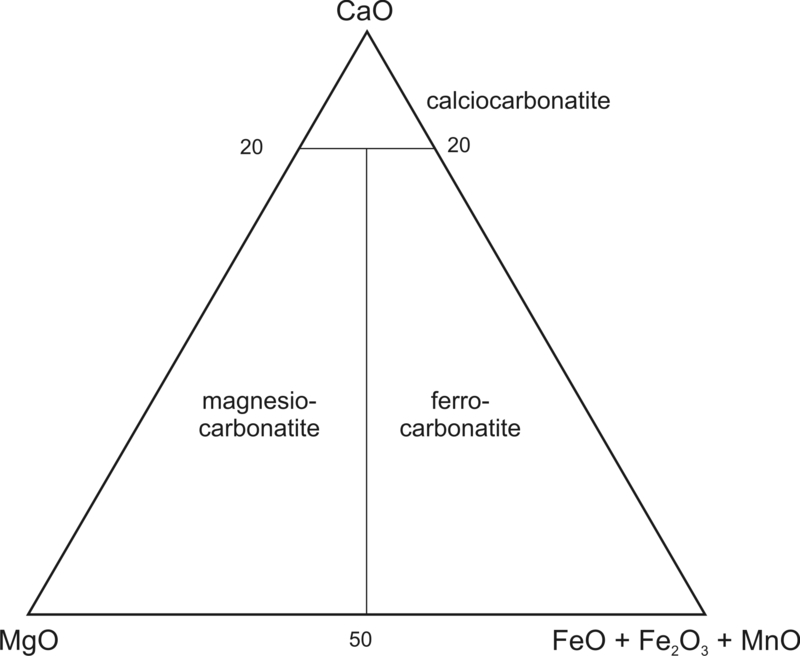 Carbonatites are also classified according to their bulk chemical composition (Fig. 13). The classification is used when modal composition is unavailable, complex Ca-Fe-Mg solutions are present, and the rock contains less than 20 % SiO2. If the SiO2 content exceeds 20 %, rock is classified as silicocarbonatite. More detailed chemical classification of plutonic carbonatites is provided by Harmer and Gittins (1997) and LeBas (1999). Many alkalic rocks associated with carbonatites contain increased carbonate contents. Rocks with 10-50 % of carbonate minerals acquire prefix defined by the prevailed carbonate, e.g. calcitic ijolite, carbonatic ijolite. Silicate rocks with less than 10 % of carbonates can be described as ijolite with calcite or ijolite with carbonate. Fig. 13. Chemical classification of carbonatites based on wt. % oxides (Wooley and Kempe 1989). Best, M.G. & Christiansen, E.H., 2001: Igneous Petrology. Blackwell Science, 458 pp. Fisher, R.V., 1966: Rocks composed of volcanic fragments and their classification. Earth Science Reviews 1, 287-298. Harmer, R.E. & Gittins, J., 1997: The origin of dolomitic carbonatites: field and experimental constraints. Journal of African Earth Sciences, 25, 1, 5-28. Kerr, A.C. & Arndt, N.T., 2001: A Note on IUGS Reclassification of the High-Mg and Picritic Volcanic Rocks. Journal of Petrology, 42, 11, 2169-2171. Le Bas, M. J. (2000): IUGS Reclassification of the High-Mg and Picritic Volcanic Rocks. Journal of Petrology, 41, 1467-1470. Le Bas, M., J., Le Maitre, R. W., Streckeisen, A. & Zanettin, B., 1986: A chemical classification of volcanic rocks based on the total alkali–silica diagram. Journal of Petrology, 27, 745–750. Le Bas, M.J., 1999: Sövite and alvikite; two chemically distinct calciocarbonatites C1 and C2. South African Journal of Geology, 102, 109-121. Le Maitre R. W. (Ed. ), Streckeisen, A., Zanettin, B., Le Bas, M. J., Bonin, B., Bateman, P., Bellieni, G., Dudek, A., Efremova, S., Keller, J., Lameyre, Sabine, P. A., Schmid, R., Sørensen, H. & Wooley, A. R., 2004: Igneous Rocks: A classification and Glossary of Terms. Recommendationas of the International Union of Geological Sciences. Subcommision on the Systematics of Igneous Rocks. Cambridge University Press. 236 pp. Le Maitre, R.W., Bateman, P., Dudek, A., Keller, J., Lameyre, J., Le Bas, M.J., Sabine, P.A., Schmid, R., Sørensen, H., Streckeisen, A., Woolley, A.R. & Zanettin, B., 1989: A Classification of Igneous Rocks and Glossary of Terms. Recommendations of the International Union of Geological Sciences. Subcommision on the Systematics of Igneous Rocks. Blackwell Scientific Publications. 193 pp. Macdonald, R., 1974: Nomenclature and petrochemistry of the peralkaline oversaturated extrusive rocks. Bulletin of Volcanology, 38, 498–516. Philpotts, A.R. & Ague, J.J., 2009: Principles of Igneous and Metamorphic Petrology, Second Edition, Cambridge University Press, 667 pp. Streckeisen, A. L., 1973: Plutonic rocks, classification and nomenclature recommended by the IUGS subcommision on the systematics of igneous rocks. Geotimes, 18, 26-30. Streckeisen, A. L., 1976: To each plutonic rock its proper name. Earth Science Reviews, 12, 1-33. Streckeisen, A. L., 1978: Classification and nomenclature of volcanic rocks, lamprophyres, carbonatites, and melilitic rocks. Neues Jahrbuch für Mineralogie Abhandlungen, 134, 1-14. Winter, J.D., 2010: Principles of Igneous and Metamorphic Petrology, Second Edition, Prentice Hall, 702 pp. Woolley, A.R. & Kempe D.R.C., 1989: Carbonatites: Nomenclature, average chemical compositions and element distiribution. In: K. Bell, Carbonatite Genesis and Evolution. Unwin Hyman, London, 1–14. Yoder, H.S., Jr & Tilley, C. E., 1962: Origin of basalt magmas: an experimental study of natural and synthetic rock system. Journal of Petrology, 3, 342-532.